This volume of especially commissioned essays explores the geography of, and the role of geography in, national and proto-national identity. Place and national identity are bound together. Attachment to the one is almost always inseparable from the sense of the other. Yet, as this volume shows, the articulated self-conscious linking of place and identity is by and large a modern phenomenon that took root in nineteenth-century Europe. The formation of supranational states and the much vaunted globalization of culture led many to believe there would be a progressive dilution of national identities and a growing agglomeration of places and nations into larger state units. Precisely the reverse has taken place. This book explores the connections between identity and homeland, showing how a place may be perceived as archetypal, endowed with love and celebrated in music and poetry, yet be a pretext for violence and war. It examines the evolution of ideas about identity and their manifestations in a wide variety of settings, from the former Soviet Union to the island states of the South Pacific. 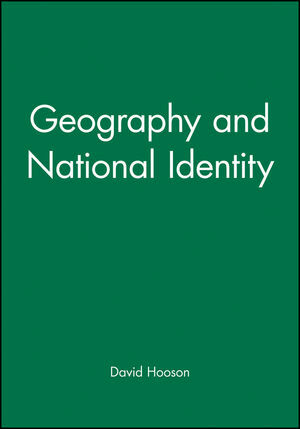 David Hooson is the author of Geography and National Identity, published by Wiley. Introduction: David Hooson (University of California). Part I: Long Established Imperial Identities: 1. European and English Landscapes as National Symbols: David Lowenthal (University College London). 2. From Michelot to Braudel: Personality, Identity and Organization of France: Paul Claval (University of Paris-Sorbonne). 3. National Identity in Vidal's Tableau de la Geographie de la France: Maire-Claire Robic (CNRS, Paris). 4. In Search of Identity: German Nationalism and Geography 1871-1910: Gerhard Sandner (Hamburg University). 5. Berlin or Bonn?National Identity and the Question of the German Capital: Mechtild Rossler (UNESCO World Heritage Centre, Paris). 6. Nationalism and Geography in Modern Japan - 1880s to 1920s: Keiichi Takeuchi (Hitotsubashi University, Tokyo). 7. Russian Geographers and the `National Mission' in the Far East: Mark Bassin (University of Wisconsin-Madison). 8. Ex-Soviet Identities and the Return of Geography: David Hooson (University of California). 9. `National Unity' and National Identities in the People's Republic of China: Lisa E. Husmann (University of California). Part II: Long Submerged Identities: 10. Edgar Kant and Balto-Skandia: Heimatkunde and Regional Identity: (Anne Buttimer (University College, Dublin). 11. Stateless National Identity and French-Canadian Geographic Discourse Vincent Berdoulay: (CNRS, University of Pau, France). 12. Nationalism and Geography in Catalonia: Mo Dolors Garcia-Ramon and Joan Nogue-Font (University of Barcelona, University of Girona). 13. Two Geopolitical Concepts of Poland: Jozef Babicz (Polish Academy of Sciences, Warsaw). 14. The Polish Image of Poland: Ladis K. D. Kristof (Portland State University, Oregon) 15. National Identity of the Ukraine: Ihor Stebelsky (University of Windsor, Canada). 16. Quest for Slovene National Identity: Jospeh Velikonja (University of Washington, Seattle). Part III: Newly Emerging National Identities: 17. Coming to Terms with Australia: J. M. Powell (Monash University, Australia). 18. Geography and National Identity in Australia: O. H. K. Spate (Australian National University). 19. South Australia: Discoverers, Makers and Interpreters: Murray McCaskill (Flinders University of South Australia). 20. Maori Identity and Maori Geomentality: Hong-key Yoon (University of Auckland, New Zealand). 21. Multiple Identities in the South Pacific: Ron Crocombe (University of the South Pacific). 22. Tradition, Culture, and Imposed Change in Indonesia: Cheri K. Ragaz (University of Zurich, Switzerland). 23. Geography, Identity and Patriotism in Argentina: Marcelo Escolar, Silvina Quintero and Carlos Reboratti (University of Buenos Aires). Afterword. Identity Resurgent - Geography Revived: David Hooson (University of California). Index. * A multi-faceted exploration of a key issue of recent theory - the link between national identity and place. * Original, international focus; contributors from all over the world.